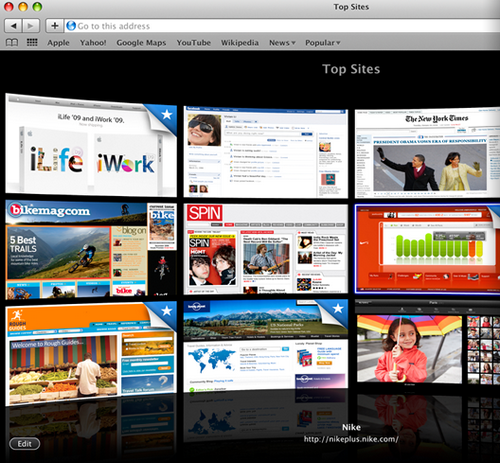 Safari 4 – The fastest, easiest-to-use web browser in the world! With its simple, elegant interface, Safari gets out of your way and lets you enjoy the web faster than any browser. Arrange your tabbed windows with just a drag and drop. Instantly and graphically locate any text on the current web page with the new find command. Easily find webpages you have visited with full history search that remembers the text content of sites. · Blazing Performance: Safari is the fastest web browser on any platform. · Elegant User Interface: Safari’s clean look allows you to focus on the web and not on your browser. · Easy Bookmarks: Organize your bookmarks just like you organize music in iTunes. · Pop-up Blocking: Say goodbye to annoying pop-up ads and pop-under windows. · Inline Find: Search any text on any website with the integrated Find banner. · Tabbed Browsing: Open and switch between multiple web pages in a single window. · SnapBack: Instantly snap back to search results or the top level of a website. · Forms AutoFill: Let Safari complete online forms for you, automatically and securely. · Built-in RSS: RSS tells you when new content is added to your favorite sites. · Resizable Text Fields: Resize text fields on any website: Just grab the corner and drag. · Private Browsing: Keep your online activities private with a single click. · Security: Apple engineers designed Safari to be secure from day one.